05.2016 ~ a glimpse of glamour. ♥ an interview with patricia gucci. too willing to dive into the intrigue-filled, highly readable memoir of patricia gucci. 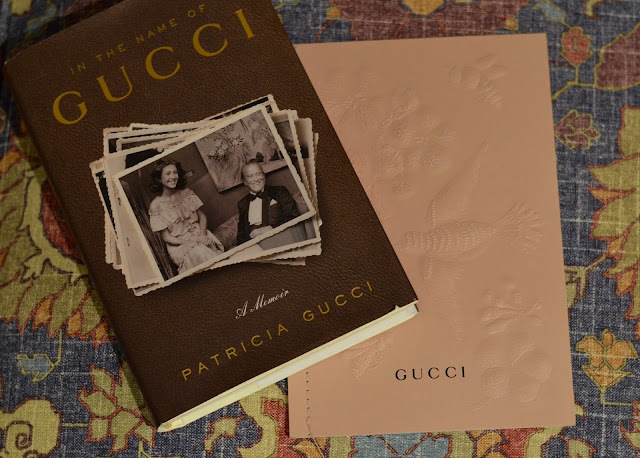 1) Gucci is a very well-known brand, but there is very little known about its history- how did the idea of writing a memoir come to life and how long did it take to research for the book? For 10 years I was under a gag order from the buyers of the Gucci business. During that time I felt that the new owners had swept my father’s legacy under the rug, which was deeply upsetting for me. In books and editorials published after his death, he was described in a way that left me feeling very uncomfortable-- not only because he wasn’t getting the recognition I felt he deserved, but because he was portrayed in a manner that was altogether different from the man my mother and I knew. father had written to her during their courtship in the 1950s. They helped me fill the gaps of the years leading up to my birth and my early childhood, which remain a mystery for so many of us. Not all parents take the time to tell their children how things came together before they were born. It was a discovery process that not only led to an understanding of who I was, but also gave me insight into my mother’s psyche and how she developed as a person. 2) Anais Nin once said, "we write to taste life twice, in the moment and in retrospect." what valuable lessons did you take away from re-living your family's legendary story? The importance of family. My father wasn’t a Brady Bunch-type dad, but he was a family man at heart, and ensured that my mother and I were always looked after. Aldo Gucci was a patriarch and also a peacemaker in what had always been a highly litigious family. He inspired perfection and excellence and those who lived up to his standards were rewarded with recognition and approval. He worked his entire life to build a business that his children and grandchildren could be a part of so that his father’s legacy would continue for generations to come. 3) Thanks to Alessandro Michele's breath of fresh life into the brand, Gucci is the name on every fashionista's lips these days. Is it strange not to be a part of the excitement in the same way you once were? The Gucci family itself doesn’t play into the brand today per se, but the heritage and legacy remain. 4) Do you like Michele's nod to the past with his revival of the brand's signature details: horse bits, interlocking G's, stripes, etc? How do you think your father would feel about the decision to have one women/men's show combined per season? To see his heritage live on like this, with the rhombi design, interlocking Gs and the Gucci loafer still going strong, would undoubtedly have made him happy. 5) Would you ever like to see the Gucci story told on the big screen? Who would you want to play you? I would love to see the story on the big screen, of course, and there are ongoing conversations about this. As far as who is like to play me? ♥ when life hands you lemons..
... take photos in the lobby! i think it is important to remember that not everyone has such a privileged lifestyle. and panels like the one i went to on sunday need to acknowledge that.